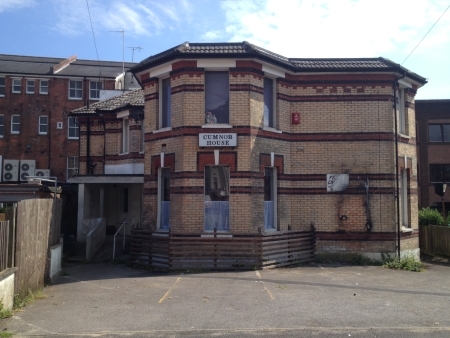 Bournemouth Borough Council: Pure Town Planning have recently secured planning permission for a revised residential scheme in Cumnor Road in the heart of Bournemouth’s Town Centre. The revised scheme includes alterations, conversion and the addition of a 2nd floor to form 10 studio flats with associated access and parking. The approval follows a previous scheme which sought to redevelop the existing building which currently houses two large residential flats. The previous scheme was refused by Bournemouth Borough Council and subsequently dismissed at appeal on the basis of inappropriate design, inadequate parking provision and landscaping issues. 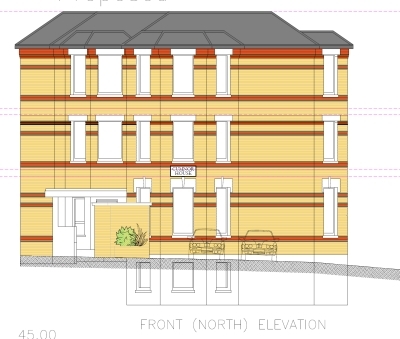 …and as proposed (with additional storey). At this stage, Pure Town Planning were approached to manage a revised scheme to systematically deal with the previous concerns and reasons for refusal from the both the local planning authority and the Planning Inspector. With the assistance of the designers, Elcock Associates, issues relating to the design, parking spaces and outdoor amenity were comprehensively addressed and redesigned through in-depth discussions, additional site visits and further consultations which undoubtedly improved the proposed town centre redevelopment for both its future occupiers and also the surrounding properties. It was critical to the success of the application that the proposal seamlessly fit into the context of the Cumnor Road area, especially considering the spate of recent large scale flatted redevelopments along Lorne Park Road. The vision has always been to bring back into use and regenerate this ageing building, granting it a new lease of life by providing much-needed high quality residential flats in the town centre and this is something we are delighted to have helped achieve for the applicant following a series of setbacks under previous schemes. If you are wondering whether you are missing an opportunity to convert and redevelop an existing town centre residential or commercial property, then we would be happy to advise you. We offer a confidential FREE half hour consultation so to discuss the potential development of your property, please call us on 01202 585524 or email info@puretownplanning.co.uk to find out how we may be able to help.